A bizarre, humped Carcharodontosauria (Theropoda) from the Lower Cretaceous of Spain. 2010. F. Ortega, et al. Nature 467: 203-206. Abstract: Carcharodontosaurs were the largest predatory dinosaurs, and their early evolutionary history seems to be more intricate than was previously thought. 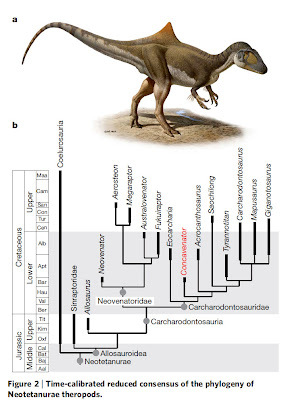 Until recently, carcharodontosaurs were restricted to a group of large theropods inhabiting the Late Cretaceous Gondwanan land masses, but in the last few years Laurasian evidence has been causing a reevaluation of their initial diversification. Here we describe an almost complete and exquisitely preserved skeleton of a medium-sized (roughly six metres long) theropod fromthe Lower Cretaceous series (Barremian stage) Konservat-Lagerstatte of Las Hoyas in Cuenca, Spain. Cladistic analysis supports the idea that the new taxon Concavenator corcovatus is a primitive member of Carcharodontosauria, exhibiting two unusual features: elongation of the neurapophyses of two presacral vertebrae forming a pointed, hump-like structure and a series of small bumps on the ulna. We think that these bumps are homologous to quill knobs present on some modern birds; the knobs are related to the insertion area of follicular ligaments that anchor the roots of the flight feathers (remiges) to the arm. We propose that Concavenator has integumentary follicular structures inserted on the ulna, as in modern birds. Because scales do not have follicles, we consider the structures anchored to the Concavenator arms to be non-scale skin appendages homologous to the feathers of modern birds. 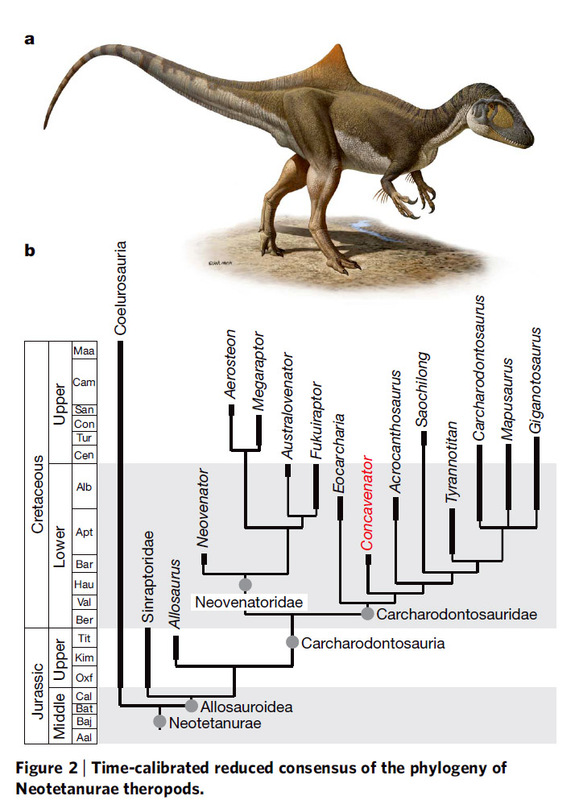 If this is true, then the phylogenetic bracket for the presence of non-scale skin structures homologous to feathers in theropod dinosaurs would be extended to the Neotetanurae, enlarging the scope for explaining the origin of feathers in theropods.